One, small firework shot from a riverbank that inadvertently saves the lift of Shoya Ishida in the opening scenes of the film. As Shoya is about to throw himself off of a bridge, a firework disrupts his thoughts. He walks away from the railing. 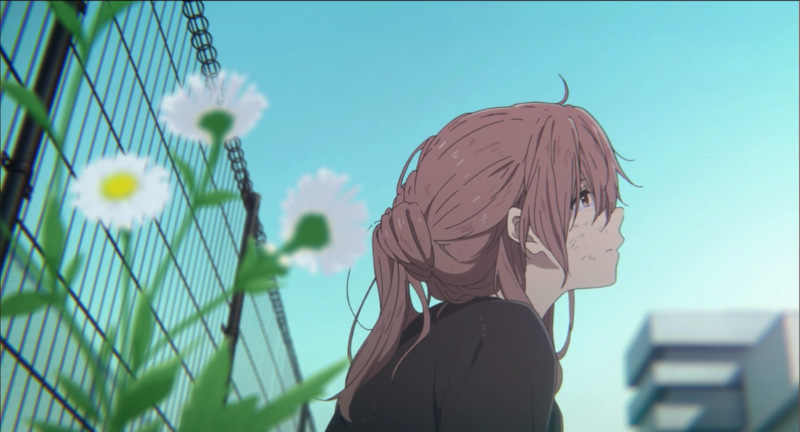 When Shoko Nishimiya tries to take her own life later in the movie, the attempt is framed with the grand finale of a fireworks show. 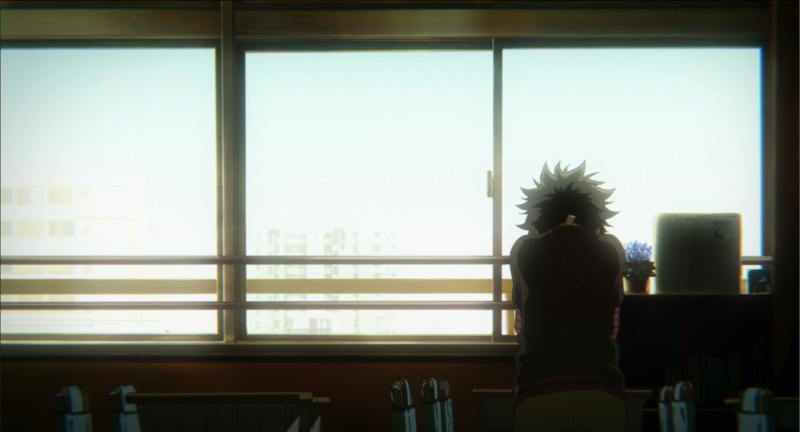 Fireworks provide the backdrop for both suicide attempts in A Silent Voice. This is a purposeful choice by director Naoko Yamada, who makes the most of anime as an audio visual medium throughout the film. 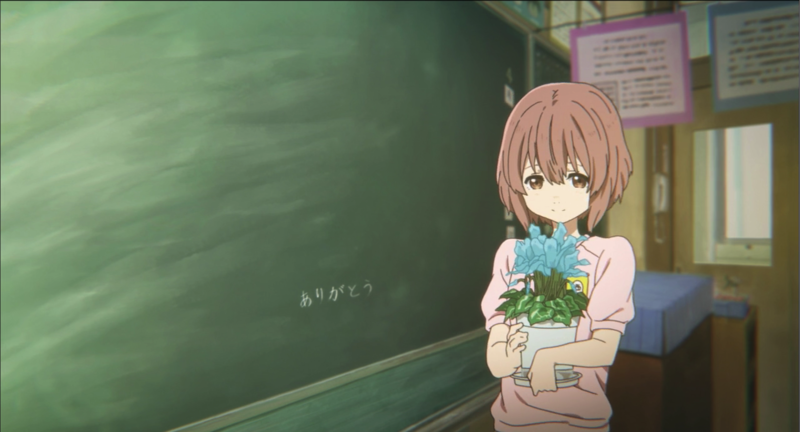 Since A Silent Voice is centered around the arrival of a deaf girl, Shoko Nishimiya, to Shoya Ishida’s elementary school class — and their interactions for years to come — animation and cinematography not only help frame their story thematically, but aid in allowing the audience to further understand Shoko’s situation. 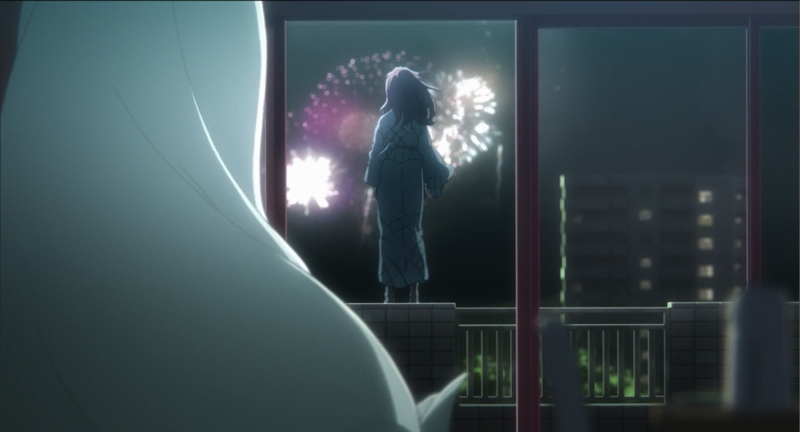 Just before her suicide attempt, she is shown feeling the vibration from the sound of the fireworks, one of the few times that she can “hear” something in the series. Hanakotoba, the Japanese flower language, is meant to communicate a strong emotion or impression from giver to recipient without needing words. This is something that Shoko desperately needs in any form, especially when her initial attempts at communicating with her classmates via notebook only serve to facilitate their bullying. Similarly, ikebana, the art of flower arrangement, is meant to unify humanity and nature through minimalist but careful presentation. The simple act of arranging allows for moments of spiritual reflection and a small, peaceful moment where one can appreciate the beauty of nature. Fireworks have their own meaning in the tradition of Japanese aesthetics, exemplifying impermanence and transient beauty — a moment in time that will never come again. Using them as the backdrop for both Shoya and Shoko’s respective attempted suicides adds an extra layer of ephemerality. All of life is ephemeral, the fireworks seem to say. it would be a shame if either Shoko or Shoya’s moments ended so soon. 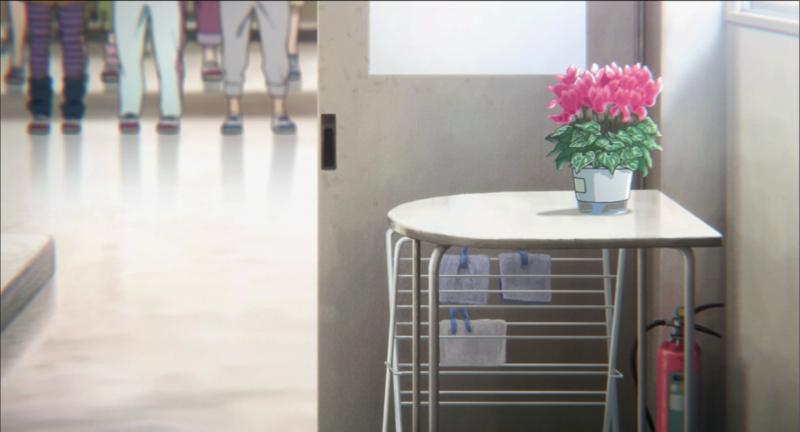 Throughout A Silent Voice, Shoko is primarily represented by two flowers: a white daisy, and what appears to be freesia, in both red and blue. 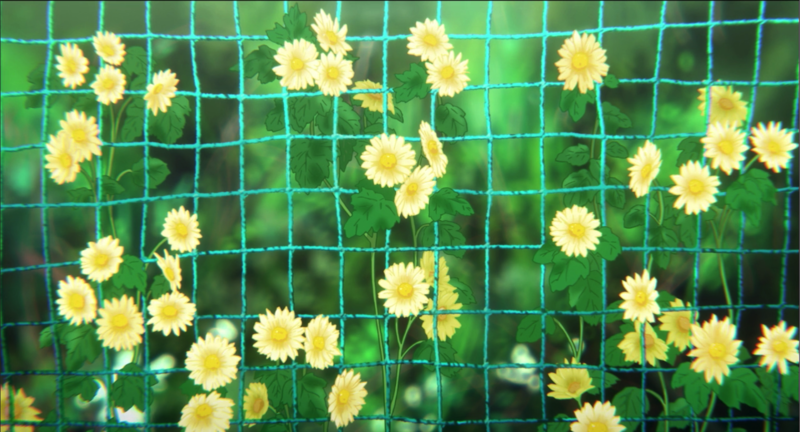 Daisies have been used in other anime — Chidori Takashiro from Kiznaiver was also represented by a daisy flower — and symbolize purity or a return to innocence. This is especially true if the daisy is white. As a gift, daisies send a message of faithful, almost childlike, love. 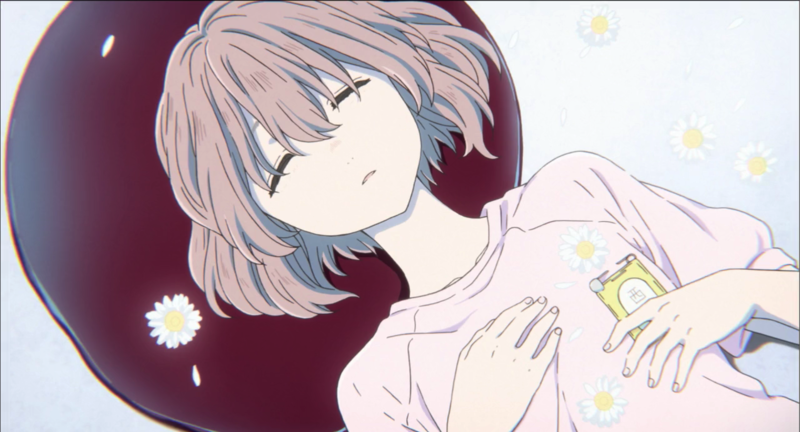 When Yuzuru Nishimiya dreams of her sister Shoko the night their grandmother passes away, it’s in a pool of blood surrounded by daisies. We later learn that Yuzuru has known of Shoko’s suicidal tendencies for a while, and had plastered the walls of her room with photographs of dead things in an attempt to turn Shoko away from death. Daisies frame Shoko on the ground when she is assaulted by former classmate Naoka Ueno, and remain a few moments later when Shoko apologizes profusely to Miyako Ishida for Shoya’s hospitalization. Although daisies often represent a return to youth, or the innocence of childhood, they can also symbolize new beginnings. 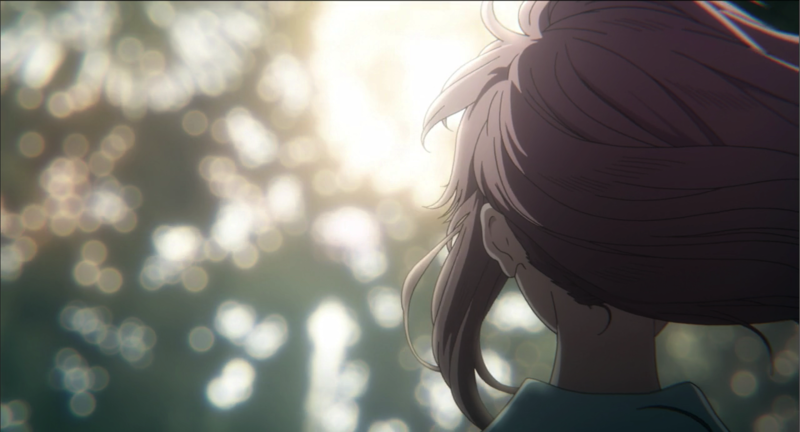 In this case, Shoko is beginning to realize the affect her suicide attempt and actions have had on others — well outside the direct result, Shoya’s injuries — and is creating a new beginning for herself. Her default response has always been to apologize. This is the first time where it seems like Shoko truly means it with every fiber of her being. She sobs at Miyako’s feet, begging for forgiveness. 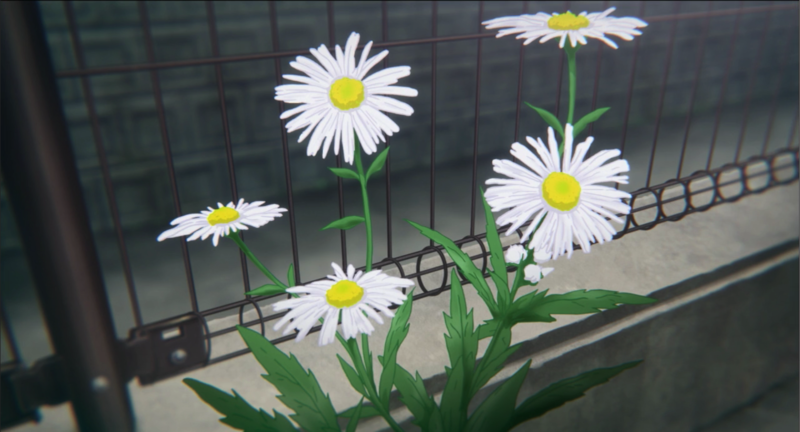 The white daisy frames Shoko, but other colored daisies appear as establishing or pillow shots between scenes towards the beginning of the movie. Purple daisies follow a scene where Shoya discovers Shoko at her desk and lashes out at her, causing her to retaliate and vent her frustrations for the first time, and yellow daisies are shown after Shoya finds out that Shoko transferred schools. The purple and yellow daisies could also be cosmos, which have similar connotations of innocent and pure love. Neither situation is particularly uplifting or happy. However, in both appearances further remind us of Shoko’s faithfulness. She was cleaning mean graffiti off of Shoya’s desk in the first scenario, and presumably is still thinking about him, even after she transfers, in the second. Despite the fact that his primary feeling towards Shoko at the time is guilt — especially when the bullying is turned towards him — the flowers are a constant reminder of her faithful innocence. *I initially had incorrectly identified this as freesia and am updating the post to reflect this. This flower appears in red and in blue as the classroom flowers for the day. Cyclamen has a few interpretations, some of which are conflicting. Like Shoko’s daisy, cyclamen can also express love, but it’s a more determined and lasting one. Rather than innocence, cyclamen are gifted to show a deep, unwavering affection. Some have called it the flower of true love. Rather than this interpretation, A Silent Voice could be calling to another meaning of cyclamen, resignation or goodbye. 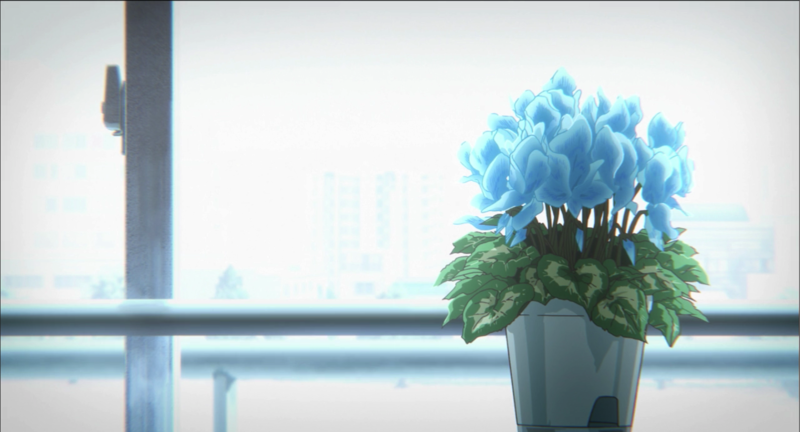 The plant appears several times in the classroom, and its first appearance is notably outside of the music room, where things begin to immediately go wrong between Shoko and her classmates when she tries to sing and they stifle their laughter. It again appears in her hands when Shoya writes a mean thing on the blackboard and pretends to erase it. She thanks him, another expression of her sincerity, but his teasing will escalate and eventually lead to their parting for a few years. There’s one last meaning of cyclamen that could apply, and it’s a love that is rare or to unusually difficult to grasp, another nod to a deeper kind of admiration or love. Shoko and Shoya’s relationship is a difficult one, regardless of whether they end up together romantically or not, but by the end of the film, there’s no doubt of their admiration for each other. 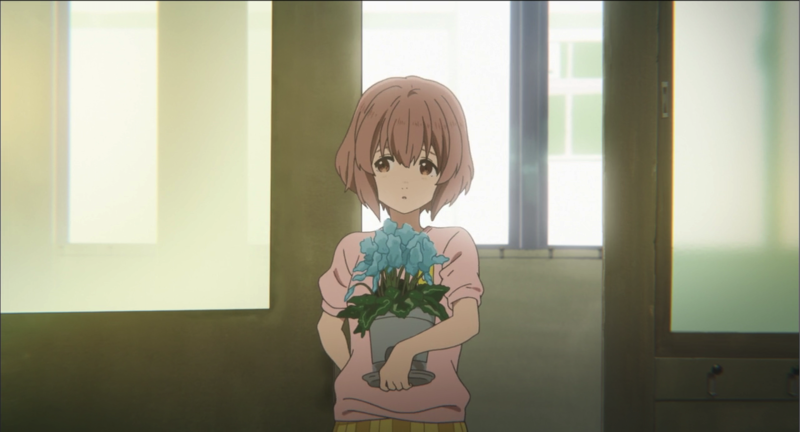 This is the first of two posts that will focus on flower language in A Silent Voice. The second will look more at establishing/pillow shots in addition to foreground/background focus and framing. 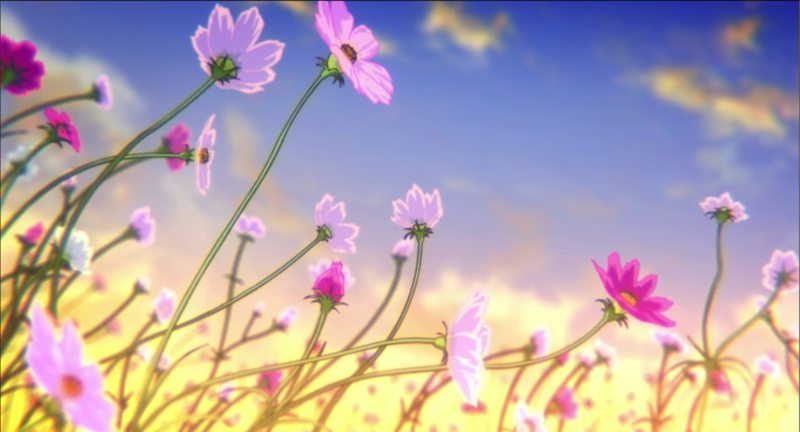 Your analysis of flower language is an excellent entry point into the visual aesthetic of this anime. However, I must caution you to research the names of the flowers – these are not freesias, but cyclamen. Others that you call daisies are either cosmos (the pink/purple) or calendula. Having said that, I do remember that the Japanese everyday language rarely distinguishes among flowers, other than the iconic sakura. Thank you so much! I’m going to edit this now. I’m sorry for the mistakes. I was really hesitant on the freesia analysis actually because the leaves at the bottom (large/broad with light green/white) were obviously wrong. Again, I’m sorry for the mistake. Thank you for being so receptive to your readers’ comments. The second part of your flower analysis is absolutely wonderful! It really captures the amazing variety of detail that the authors/artists put into that one aspect of the film. Ah thank you! ^ ^ Also I’d rather be correct so I’ll always be receptive when people point out inaccuracies, so thank you again. Sorry. I didn’t mean to pile on. DMZ replied while I was checking my information. Oh, and maybe this is a bit out of topic, but before the scene where they went to the fireworks festival, Shoko and Shoya went to the “Site of Reversible Destiny – Yoro Park”, a real life location in Japan. I think the name is somehow fitting considering what happened at the fireworks festival, yet I didn’t see anyone mentioning this… yet, at least. This was an interesting look at the symbolism in the film. 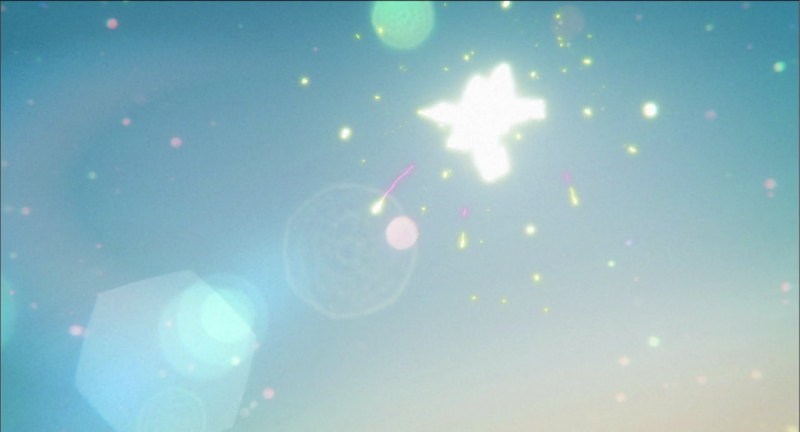 I especially enjoyed when you pointed out hanabi as being another type of flower in this film. What a connection: the short life of these beautiful fire flowers to the abrupt end of suicide. Burning bright, dazzling many, and vanishing before the joy they bring is gone. Thank you for sharing. I haven’t seen A Silent Voice yet, but it has now made its way onto my “to watch” list. Thank you for this! I’ve always admired the use of flowers throughout the film, so much so that I watched it in four different theaters within ten days. Sadly, I’m not educated enough about the actual meanings, so this is mandatory reading for me. Can’t wait for the second part! An anime that centers its theme on bullying which, however, is filled with scenes of legs that is quite wonderful to see. For anime to feature deaf characters is rare and this movie really catch the heart of every people that watches it. Really, everyone will be moved from its story. Also, it has wonderful character designs too. Pingback: Flower Language in Japanese Animation – Andre Sepriza Blog. Pingback: Daisy As Shouko – Andre Sepriza Blog. Pingback: Love As Cyclamen – Andre Sepriza Blog. Pingback: Azaleas , Marigold , Hibiscus 1 / 2 – Andre Sepriza Blog. Thanks for your work i love this movie and i’m digging on all i can found about it.